The Vilcabamba range of mountain located to the southeast of Cusco is a very important section of the Andes Cordillera, this is one of the mountain range in Peru that has the highest concentration of snowy peaks, this creates beautiful high Andean landscapes with vast snow-capped mountains and large glaciers, which in their thaws make to appear beautiful lagoons, lakes, nice valleys. Nowadays with the passage of time many of these summits are completely uncovered of snow and they show a special natural pigment of the rock that together with some minerals and the special color of the soil of this place creates beautiful mountain, they are very striking by the colors they show, these together with the local people who are mainly breeders of Alpacas and Llamas will make this tour in an unforgettable experience, breathe deeply and live the 5020 meters of “Vinicunca” (The rainbow Mountain). DIFFICULTY: MODERATE – HARD (This is more for the altitude). We pick you up in your Hotel around 3:30 to 4:00 a.m. then we’ll travel 02 hours on a bus to Cusipata where you’ll have a delicious breakfast, after we continue to Phullawasipata (4626 mts. /15177 fts.) this is the trail head where we start the hiking, first we walk 1 and a 1/2 to two hours uphill where you will find a beautiful landscape, big mountain and local people with their typical clothes making their daily life, you will find groups of Alpacas, Llamas and sometimes wild Vicuñas, also small lagoons created by the thaws of the glaciers, once you arrive at the summit (Vinicunca 5020 mts. / 16469 Fts.) you will have a free time to rest and to take your pictures, then, we start to go back by a different way, the “Red Valley”, we call it likethat for the red color of the mountain soil, they look pretty nice and you will find only a few people, this is a totally different experience, this will be other 2 and 1/2 hours walk downhill to arrive again in Phulawasipata where our transportation will be waiting for you to take you to have a comforting lunch, then we will bring you back to Cusco again around 4:30 or 5:00 p.m. (we drop you off one block from the main square for the traffic). Briefing a day before in INKA TIME's office (Optional, if you can not come and you have an extra question you can text to our Whatsapp). Pick up in the Hotel. Tourist Transportation to go and back (including polar blankets). 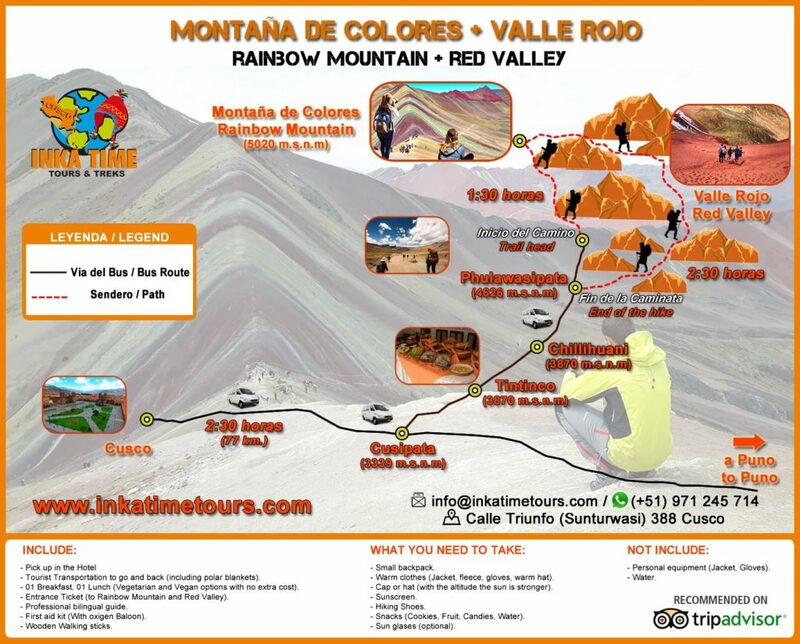 Entrance Ticket (to Rainbow Mountain and Red Valley). First aid kits (With oxygen tank). Horse rental (S/ 60.00 like a US$ 20) Those are rented by the local campesinos, you can pay on the same day. Prices showed are for tour in group service (groups from 10 to 15 people per guide), ask for tours in private service. Warm clothes (Jacket, fleece, gloves, warm hat) it's windy all the time. Cap or hat (with the altitude the sun is stronger). Snacks (Cookies, Fruit, Candies, Water). Breakfast is around 6:00 am. and lunch after 13:00 hrs. 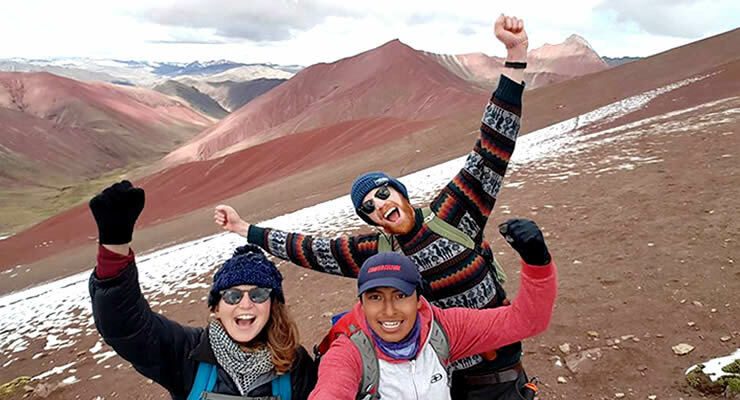 This service in a GROUP TOUR means that you will do the tour with other people, This standard service has 12 to 16 participants, that doesn't mean you have to get that quantity of people to do the tour, we have confirmed departures every day, so, If you are only one or two people do not worry, you can join some of our groups. "BEST VALUE PER PERSON: US$ 30.00"
Complete the booking form or send data of all the travellers to info@inkatimetours.com as Full name, passport number, nationality, date of birth, or a copy of passports, indicating the exact date of travel; Our privacy policies are strict, INKA TIME will use this information exclusively to nominate the reservation tickets, we never share this information with third parties. Choose the best way to pay and make a payment, for this hike the payment is in 100%; There are 03 ways to pay: Wire money by Western Union, payments via "PAYPAL" and with debit or credit card VISA or MASTER CARD (these last two options have an 8% fee), any extra commissions or fees charged must be assumed by the customer; when you send your information you have to specify the payment method you would like to use, then when we mail you back We will send you a request for payment through the platform you chose. We are one of the only agency who uses this different way by the RED VALLEY, all the agencies use the same way to go up and down, so, with us, you will have a totally different experience. 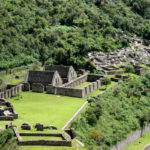 We make a direct job for the passenger (Contract between the tour operator and travelers), no intermediaries, we don’t give commissions to travel agencies or any others third parties that inflate the costs.